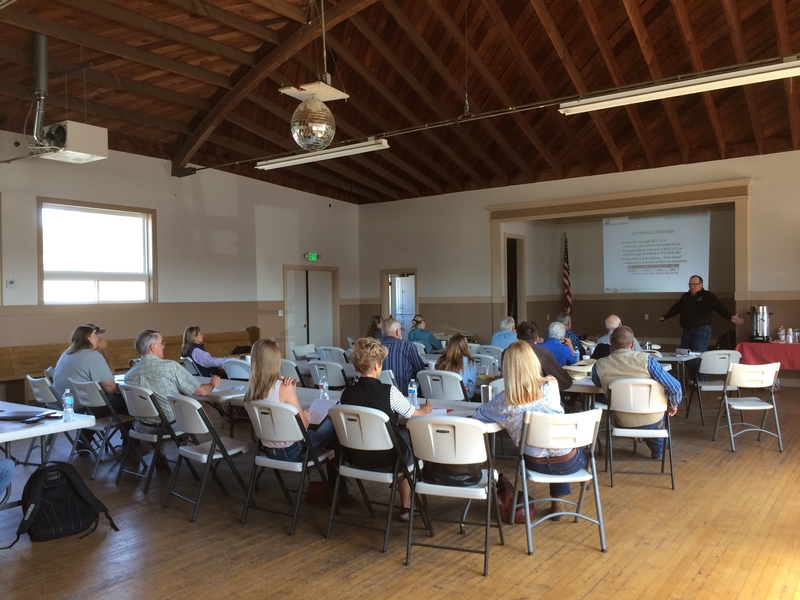 University of California and University of Wyoming Cooperative Extension recently held two workshops, one in King City and the other in Arroyo Grande, to share information about economic ranching tools, livestock health & nutrition, and rangeland management. Our University of Wyoming Cooperative Extension guests were Bridger Feuz, Livestock Marketing Specialist and Hudson Hill, Extension Educator. Hudson shared some great information about how, when and why to Body Condition Score (BCS) cattle. Click here to see the handout he provided with step by step instructions on how to BCS your animals. Bridger Feuz is an economist and showed us a few different online tools ranchers can use to help make decisions about their operations. Some of the tools on his website are the Partial Budget, Break-Even Budget, Cow Valuation, Genetic Investment, Stocking, and AUM Value tools. Here's the link to Bridger's website with all the tools: http://uwyoextension.org/ranchtools/. One of the tools he demonstrated for us was the Partial Budget tool. This tool can be used if you are thinking about making a change to your operation and you're trying to figure out if that change will increase or decrease your income. The tool is simple to use and asks four questions. 1) What new or additional costs will be incurred? 2) What current income will be lost or reduced? 3) What new or additional income will be received? 4) What current costs will be reduced or eliminated? The example Bridger used in his presentation was, should you sell 100 steer calves at 500 pounds in the fall like you normally do or would it be a better financial decision to change your strategy and keep the 100 steers through the winter and sell them the following fall at 900 pounds. Remember this is an example from Wyoming and doesn't necessarily match the production cycle here on California's Central Coast, but the tool can be used for any type of proposed change to your operation. For this example, new or additional costs would include the need for more feed and grass, more vet bills, and transportation of the 900 pound steers. Current income that would be lost is the price you would have received for selling the 500 pound calves this year. The new or additional income would be the price you receive from selling the 900 pound steers the following year. The current costs that would be reduced or eliminated would be transportation of the 500 pound calves. Once you put all of this information in the online tool, which is basically like a calculator, it will give you a number showing what your net income or net loss would be based on making this change. If you're curious about the Partial Budget tool and want to give it a try, go to http://uwyoextension.org/ranchtools/partial-budget/. Here's a link to the fact sheet on how to use the Partial Budget tool: http://uwyoextension.org/ranchtools/wp-content/uploads/2012/09/partial_budget.pdf. If you have questions about this tool you can reach Bridger Feuz at (307) 783-0570 or BMFeuz@uwyo.edu. For questions about the BCS handout, contact Hudson Hill at (307) 885-3132 or hrhill@uwyo.edu. Thank you Devi and Royce for the great program you put on for us. I hope your speakers will come back for another session. We appreciate your support and look forward to many more workshops!